"Our world is composed of many kinds of communities that depend on the land for their sustenance. In the last hundred years much of our land has become degraded or threatened. If we and the other creatures are to flourish, we must take better care of the land which has sustained us.The Bodega Land Trust is a community committed to caring for the land. We intend to do our part; we hope you will join us. 1. The opportunity to preserve and restore agricultural lands, forests, streams, wilderness, natural habitats and resources in perpetuity through acceptance or purchase of land or conservation easements. A conservation easement is a legal agreement a landowner makes to limit the nature of future development. Each easement is uniquely tailored to reflect a landowner's desired land use. Donations may result in tax advantages to owners. 2. 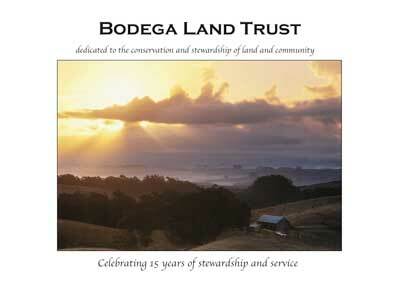 Participation in the preservation of land and community by joining Bodega Land Trust. 3. The opportunity to help develop and encourage rural communities through involvement in projects like the Salmon Creek Watershed Project. 4. Membership, including naturalist-led day hikes, nature seminars and newsletter. Bodega Land Trust is a tax-exempt 501(c) 3 organization. call (707) 874-9001 for info.